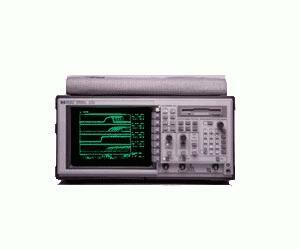 The Agilent 54540C 500 MHz realtime oscilloscopes have the extra performance and features that you need to get an accurate view of the high frequency signals you encounter, whether you do analog or digital design, R&D or manufacturing test. With 32 K memory per channel, 4 channels, sample rate up to 2 GSa/s, 1 ns peak detect, and sophisticated triggering, you can be confident that you will not miss critical signal activity. These feature rich digitizing scopes also include standard FFT, floppy disk drive, and sequential single shot acquisition for better analysis and characterization of your signals. Choose between a color flat-panel display (54540C) or monochrome display (54540A).